Your bike looks great. Nice to see it running. That smoke is a bit of a worry though. Oil that you put in the cylinder would have been burn off in a few seconds, so to have it smoking for minutes may be something else - rings or valve guides. Maybe the rings will settle with a bit more running? I was thinking the same, but if the oil down the cylinders was ‘liberal’ it may have just pushed it into the exhaust where it’s being burnt off? Yea, I was worried about how much smoke was rolling out. That made me curious too. Pulled the old dear out to see if she'll ever clear up. Apparently the key word was liberal. Got the oil temperature up closer to operating level. Another "issue" reared it's head. 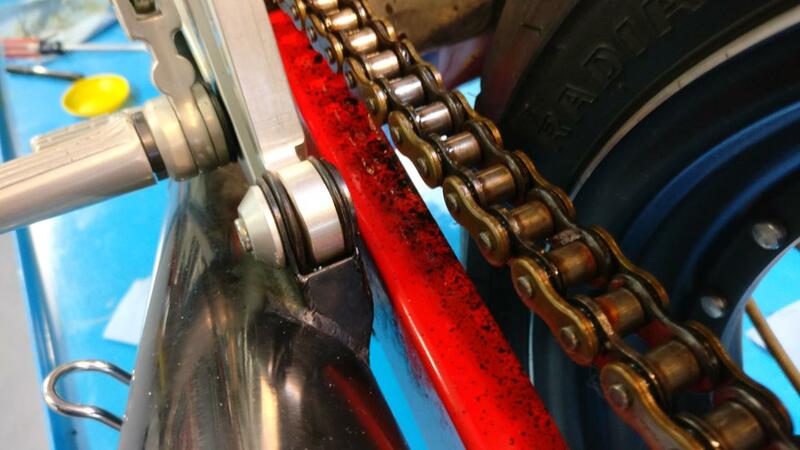 On the up side, I'd never have to worry about lubricating the chain ever again. Downside would be only ever running through right hand corners. Easy peasy. Hopefully it's a common size. Nope, Not a common size. However available. That's great. I'm glad the smoke cleared up. 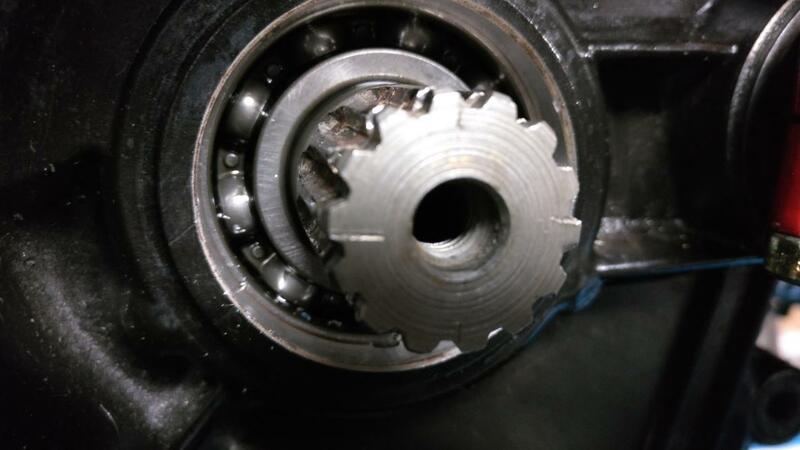 Also good to see you've pulled the countershaft seal out in-situ. You should be able to push the new seal straight back in. Ordered this Monday morning. It arrived to my door the next day at 16:15. Maybe to others this is nothing special but to an old guy like me, I'm blown away how stuff is shipped all over so quickly. Slipped into place like it was made for the space. The bike is back on the stand with the rear wheel off the ground. I've run into a snag with the rear brake master cylinder. I'll follow up with that soon as it's sorted out. Maybe by then the cold front will have moved along too and I won't mind slipping the bike outside again. Can test run the seal repair at that time. 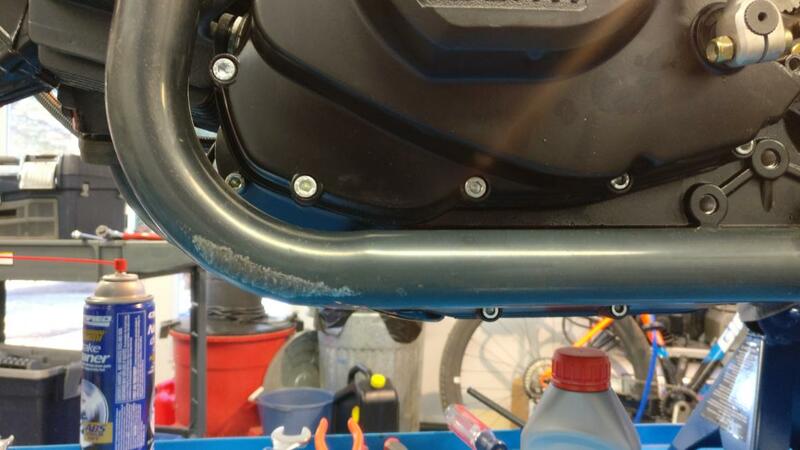 When running with this exhaust, the fairing belly was beginning to dis-colour. Once I've got the bike on the road again, I'd like to minimize this. Has anyone tried wrapping the exhaust with fiber tape? Maybe there is other means of protecting the fiberglass from overheating? Suggestions and solutions from others gratefully accepted. I've had the same issue....but with the header on the RHS....but I have seen issues mostly on the left like yours.....all due to tolerance and tightness of fit...and that ruddy joint piece between the 2 headers under the crankcase that is also where the kickstand is bolted to...it effectively turns the whole system into a solid one piece unit that you cant jiggle around. I would suggest one of 2 things....You can buy titanium heat wrap exhaust bandaging that comes with stainless steel "zip" ties to fix it with...as evidently nylon ones would melt.....I question the titanium part coz you can cut the woven quilted tape with household scissors....but it still helps. 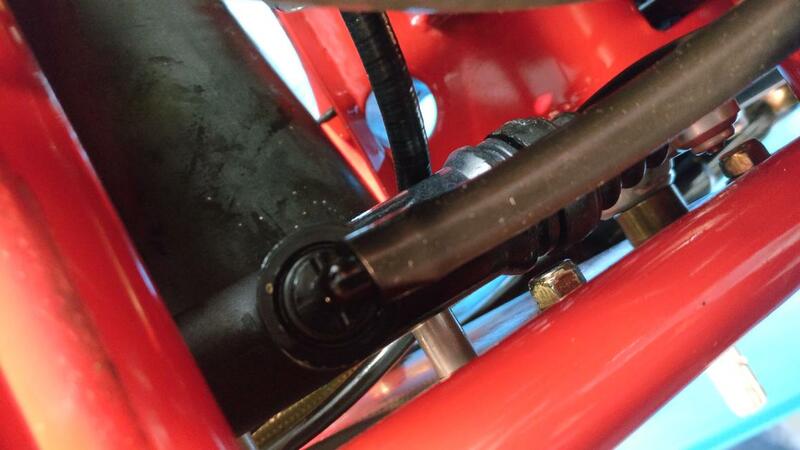 [quote="Rocketron"]Front forks have been disassembled, Ellis found a bushing which should be replaced. He says it's been difficult to locate a new one. The german Laverda owner posted:..... I hope this is the part you are talking about!! 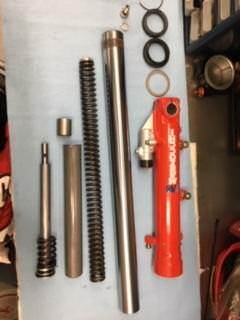 “if you take the M1R appart, there is a big alloy part sitting at the lower end of the right side fork slider (the one where the adjustable compression valve sits on). You can push that out to clean it and everything below by using a piece of round material which you use to push this round thing up from the bottom side of the fork slider. Welshlamb note : i believe some Laverda MIrs had only one. Bush fitted others two.. hence the listings. I'm going to pass this to my suspension guy so he can add this to his information. I'm going to have to say for me, I'm not opening up the suspension again for a while. 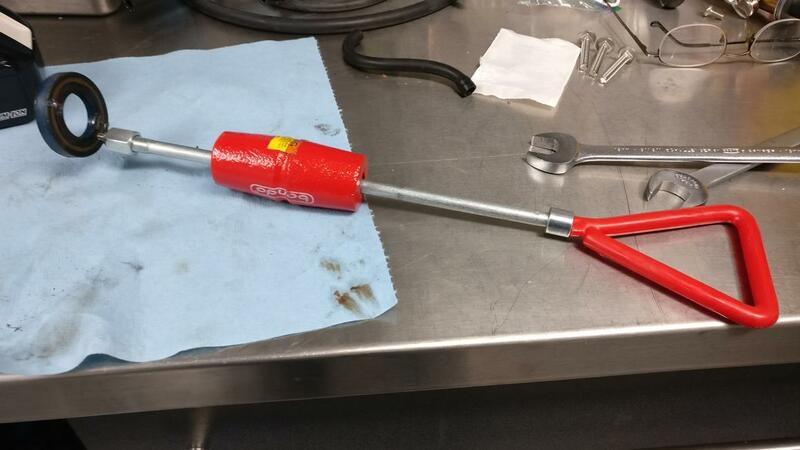 Hopefully others will find this useful when they disassemble the forks. Maybe somebody is wondering where I went? 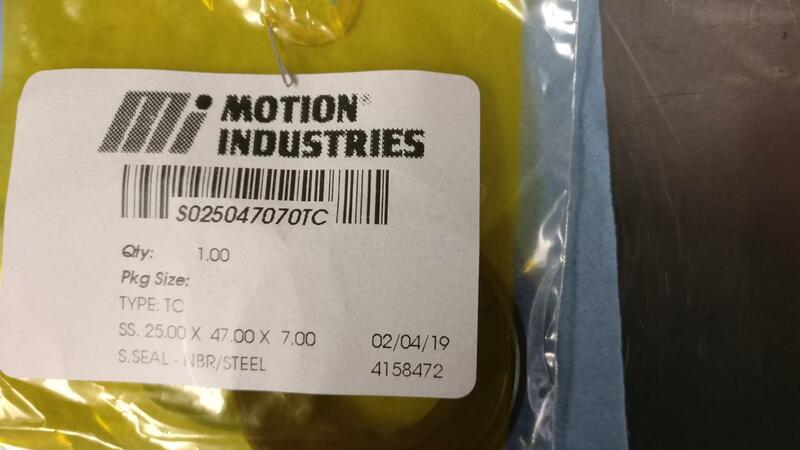 Maybe not... .
A few weeks back (Feb 5th) I mentioned I had hit a snag with the rear brake and I would update once I had more information. That snag was a little bigger than I first thought... In fact it got so big I had to walk away for a little. When frustrated I should never be doing anything mechanical. Thankfully skiing has been pretty good this year! I installed the rebuilt master cylinder and caliper, began to bleed the system and it all went sideways. It's impossible to see looking at it here sitting on the bench but it didn't work. I couldn't get any brake fluid past the master cylinder to the caliper. I took it off the bike to contemplate the problem and decided at some point either the piston became longer or the cylinder became shorter. 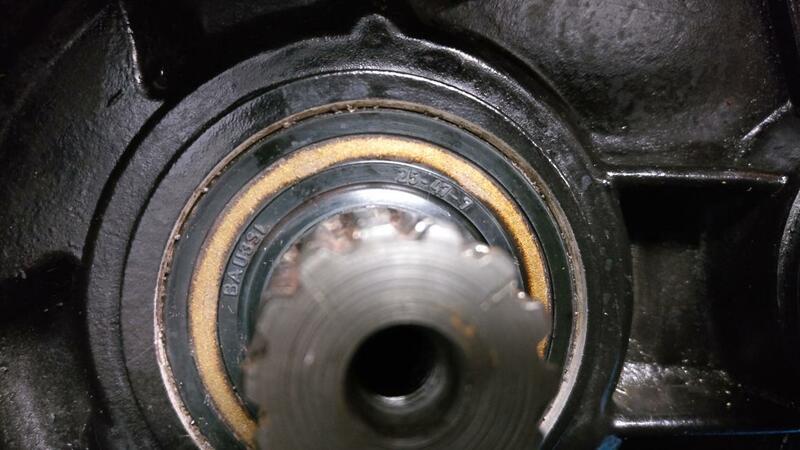 The hole into the cylinder from the reservoir was blocked by the piston. Some careful measuring after dis-assembly confirmed this. Contacting the person who rebuilt it didn't provide any satisfaction... I was on my own to figure this out. So I ground some of the piston away, so the hole would be exposed into the cylinder. Some trepidation doing that I can tell you. Once that had been done, I re-assembled it all once more. Still no joy. *sigh*. Now I'm really confused. Maybe I shortened it too much?? Time to walk away. I returned to it a couple of days ago. Other than it should work, I've not a lot to go on. 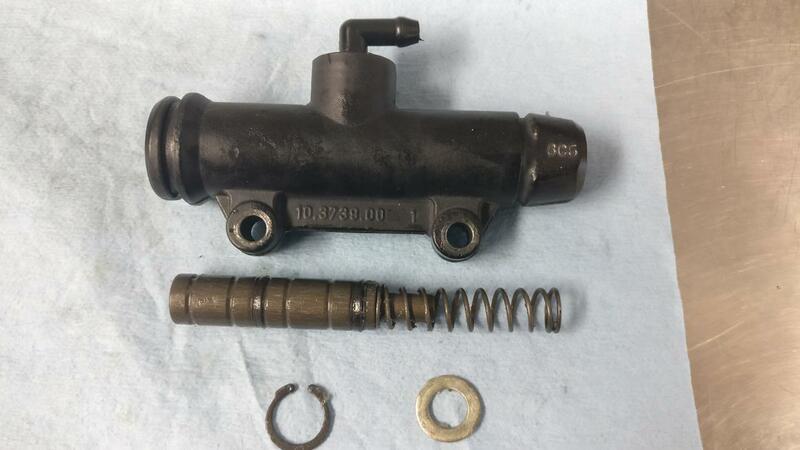 Thinking I'd really messed things up, I began shopping for a new master cylinder. Hey guys, guess what? These are rare, who would have thought? 12mm rear master cylinders are rare, 12mm with 50mm separated mounting holes are even more rare. Which looking at it now, makes me suspect I have a piston from a much more common 40mm mount. Someone else might know the difference between these? Not willing to give up, I kept bleeding the system and buying brake fluid between sessions. I tried just about every known position for the caliper. I tried a vacuum pump. I tried a syringe to force fluid in. Recommended btw from the person who rebuilt it. He did say this would be a challenge. Stubborn me went back twice today and finally prevailed. I suspected some air was preventing fluid from getting behind the pistons. I bled and bled from the caliper. Finally I shot some fluid inside the caliper with a syringe and got the pistons to push out. Now I was getting a tiny amount of pressure on the pads. Frustrated I walked away again, allowing time to think. 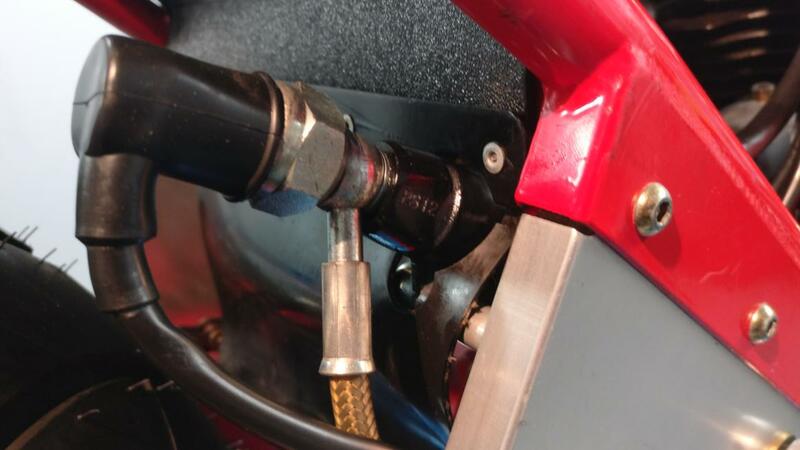 You see how the master cylinder points up? Seemed like maybe a high point could be keeping air there. 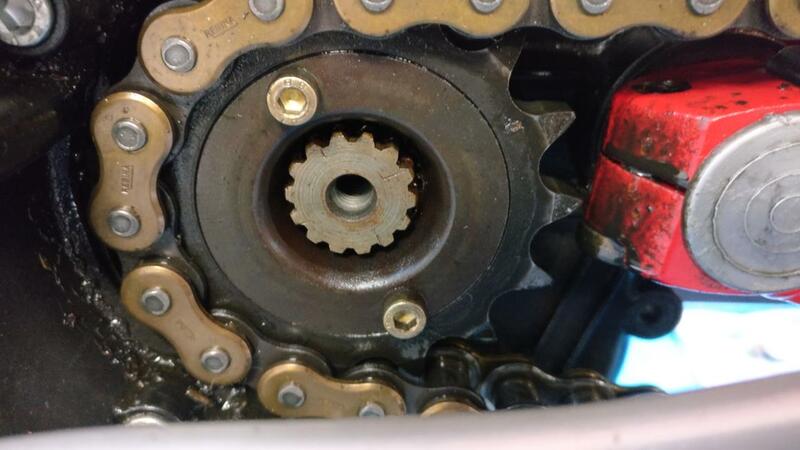 I removed the cylinder from it's mounting point and pointed it down at the discharge end. Used a screw driver to force the brake pads apart and heard a most satisfying gurgle of air bubbles in the reservoir. Reassembled everything and the brake works like a charm. Spent a half an hour cleaning up the tools and puddles of DOT4. Amazing anything still has paint on it. If you are planning on rebuilding a rear brake on a DB1, take my advice, literally. It'll save you a lot of frustration. Joy of joys I can move along to something else! The joys of bleeding brakes! They are just stubborn like that sometimes. These days if the brakes don't start pumping up in any reasonable time, I take the whole hydraulic system out, disassemble the master cylinder and caliper, clean and put back together, then start bleeding the system starting at the master cylinder. 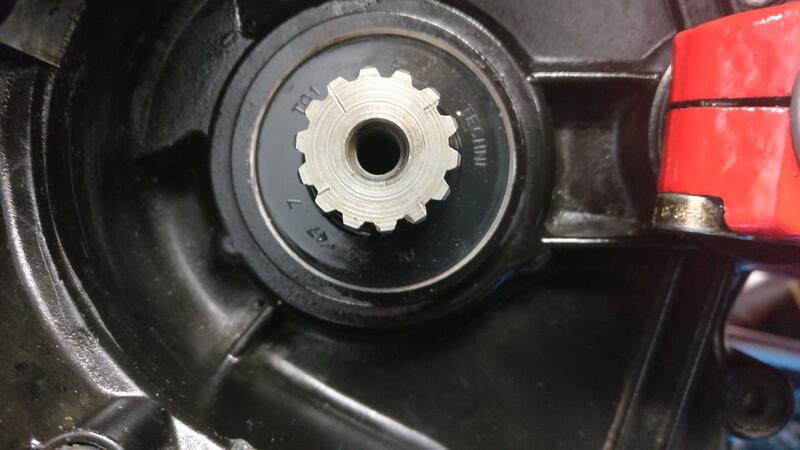 Crack the banjo bolt and get fluid coming out before moving to the next section. 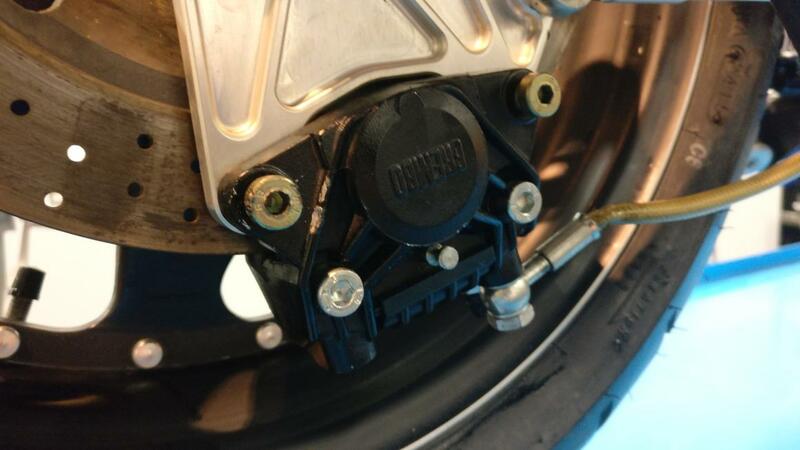 Do it off the bike if possible so you can raise the caliper above the master cylinder to get the air to the top. It's rare to have to replace anything to get it to work. But it's amazing the difference in feel when you've got fresh seals in the caliper and master cylinder. Nice and light and smooth. My son's YZ125 has back brakes waiting to get fixed and bled. It's not at the top of the job list. 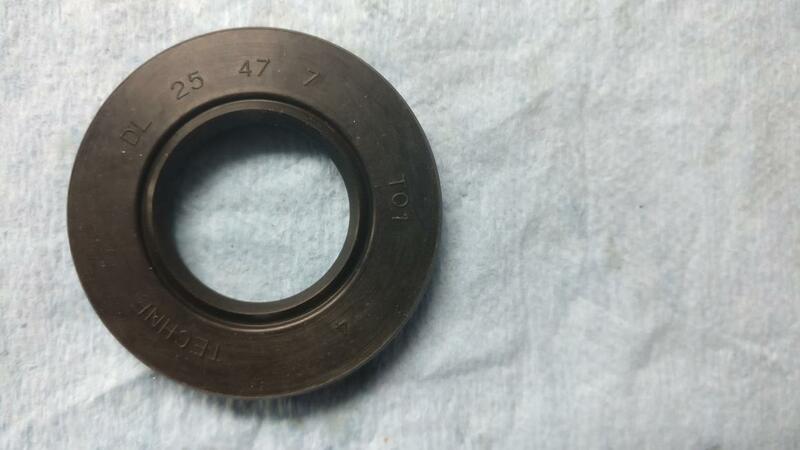 Rebuild kits aren't commonly available for the DB1 size but the seals are common across some other components. Gowanlochs helped me out here with a piston kit for a different application that had the right seals on it. I just swapped them out.